I haven't read that many issues of DETECTIVE FICTION WEEKLY, but all the ones I've read have been good. This one sports a cover by Rudolph Belarski, and the line-up of authors includes Richard Sale, Hugh B. Cave, Howard Wandrei, William R. Cox, and Cleve F. Adams. That's a top-notch group, all the way around. I happen to own the original cover painting by Belarski and it's hanging in my pulp room. A few years ago a big batch of paintings came on the market from DETECTIVE FICTION WEEKLY and I managed to buy several. This cover is the best of the lot and the most interesting in my opinion. That is very cool, Walker. I have some Detective Fiction Weekly in the collection. But the best memory I have of this title was about 10 years ago at a book & paper show in York, PA, this guy had stacks and stacks of them priced at $75.00 to $100.00 each. And the conditions were mainly only poor to fair. Needless to say I resisted buying any of them. Just after the Bordentown, NJ pulp show, another collector and I were offered 140 issues of DFW in nice condition at only $10 each. I already have them so I didn't jump at the chance but I should have because they looked better than my copies. 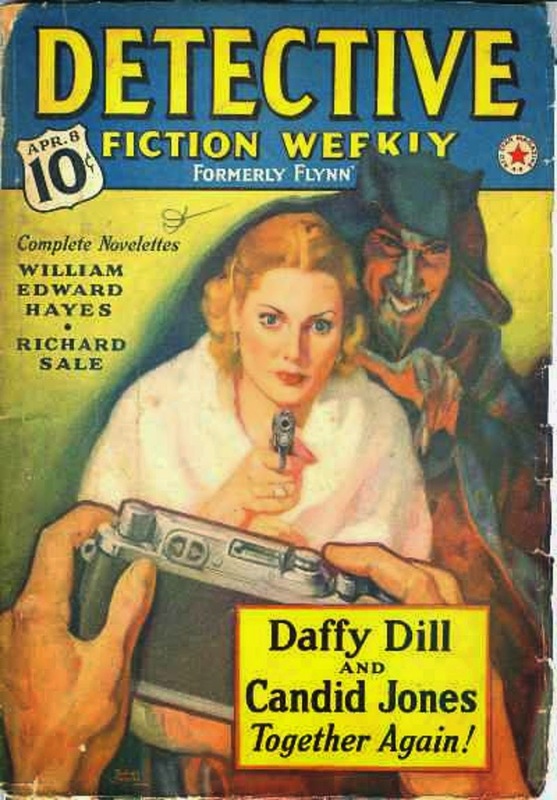 This issue features the second (of two) team-ups between Daffy Dill and Candid Jones. I'm pleased to report that AHMM will be reprinting the first story, "Flash!" in their Mystery Classics department, sometime later this year. It's a corker.